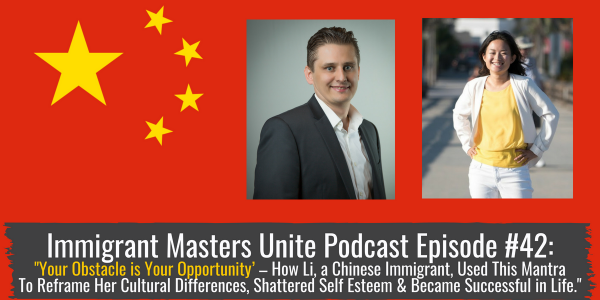 IMU 042: 'Your Obstacle is Your Opportunity' - How Li, a Chinese Immigrant, Used This Mantra To Reframe Her Cultural Differences, Shattered Self Esteem & Became Successful. | Immigrant Masters Unite Podcast: Transform Your Business, Life and The World Around You! Question for you… Have you ever had to deal with a cultural shock of being in a new country or a city, not knowing what to do, say or how to be? How did you handle it? What would you do if you didn’t speak English and everyone around you told you that you can’t do this or make this happen? How would you handle that? What if you had to constantly step out of your comfort zone to make something happen? What if you lived your life in a comfort zone that was “dangerous?” How would you handle that? These are the questions and answers we’ve dissected in today’s episode of Immigrant Masters Unite. Hey, it’s Polish Peter again and welcome to episode 42. Today, I have another great guest, Li Lin who is originally from Shanghai, China. Li came here at a very early age. You see, about 18 years ago, Li came to the USA without knowing any English. Over the years, she’s been through a lot and many immigrants can probably relate to her story. I’ve been able to relate to some of the things she has shared on today’s episode. Fast forward to today and Li has helped over 200 immigrant professionals and international students make more money by getting H-1B and OPT jobs and helping her business clients become immigrant CEOs with online teaching businesses. How did she do it? How Li overcame different cultural shocks she experienced by coming here to US form a communist country and how she turned those challenges into a positive outcome. This is a powerful story you have to hear for yourself. How she turned her shattered self esteem into being a powerful woman who created a business helping other immigrants and international students make money right here in United States. “If you want to have everything you had in your old country, what’s the point of coming?” This was a question posed to her by one of her friends and Li took that phrase on to to transform her life in the new country. Listen as this may apply to you or to your kids who need to adapt to their new life in the new country. How to step out of your comfort zone and deal with the new environment? In fact, Li took on being comfortable as “dangerous”. Yes, to her, comfort zone is dangerous. Listen and see how you can do the same. How Li used “desperation” to drive her to succeed in life. Do you feel desperate? Listen to this part of the episode to learn how desperation drove her to success, eliminate regrets and then move her life to a whole new level. So, listen to the episode right now or head over to the Itunes or Stitcher right now and listen to the podcast. Once you listen to the episode, share it with others who you think would benefit from this episode. Make sure you leave a review on iTunes as I always am grateful for your support. Thank you.